At just before 10 PM i wandered into The Drunken Unicorn. The place was nearly empty, as i had figured it would be. I was there to see the middle band on a bill, and although i enjoy Graboids’ brand of post-rock, they have never been a big draw. The first band was a local outfit i had never heard of, called This Piano Plays Itself. This was a four-piece act that added a keyboard/synthesizer into the regular rock band mix. I have to admit that i was rather impressed. These young lads play space-rock that is somewhere between Datura Dream Deferred and Parts & Labor. That’s a weird mix if you think about it, since DDD were a deep space band that bordered on the ambient, and Parts & Labor are more of a crazy math rock dance band. But This Piano Plays Itself worked a delicate balance between those two sounds. 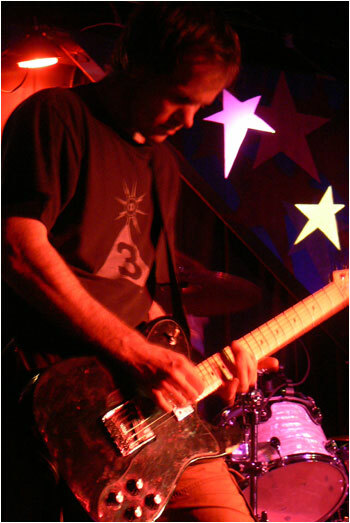 The guitars were light and echoing, while the keyboard elements were eclectic and all over the place. This Piano Plays Itself, but the lazy guitar requires interaction. The combination sounds intriguing as i write about it here, and i have to tell you: it was pretty exciting to see live as well. This band has some potential, i think. I hope to see more of them at local clubs soon! Atlanta can certainly use more fresh sounding music like this. The piano plays itself, but not on this song. While This Piano Plays Itself were performing, a respectable crowd gathered to watch them. After their set was over, this crowd mobbed the band, and i realized that in true local act fashion, most of the crowd were the fan’s buddies. I was, as usual, the only person there who is not a friend of the band or in one of the other acts. Whatever. This Piano Plays Itself and their friends wandered into the main bar at The Drunken Unicorn to celebrate their show, while i stood around the main room waiting for Graboids to setup. 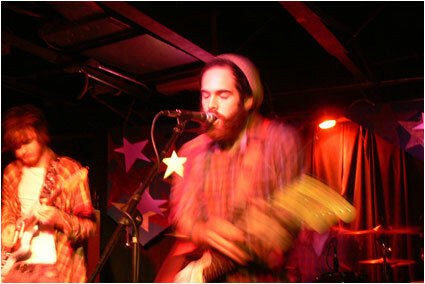 This evening marks the third time i had seen this Virginia-based band this year. The first time i saw them, they were a four-piece. The second time, at Corndogorama, they were a three-piece, with a different bassist. Tonight the Corndogorama lineup added back in the initial second guitarist, making this effectively the third lineup of the band I had seen this year, although each time involved the same lead guitarist and drummer. I guess that they are the core of the band. Tonight, the opened with their classic Weapons of Mass Distraction, playing an 8-minute version. I felt cheated – why so short this time? Then they went through three more tunes. The second i vaguely recognized, but couldn’t pin down the name of. Track three sounded new-ish, but not that far from the regular Graboids vein. Track four was Cowboy Killer, and i thought that this really shined tonight -- the guitars positively soared under their layers of distortion. 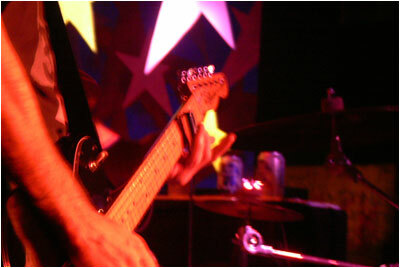 Artsy shot of Graboids use of the guitar slide. 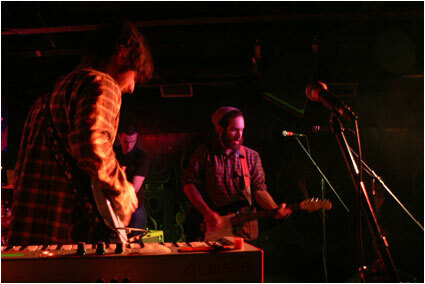 In general, Graboids play a sort of fusion rock. That is, they play old fashioned distorted rock a la Spaceman 3 or SIANspheric, but drag the songs out with long, echoing, almost ambient passages. The effect is like a heavy post-rock. I think I described them as being Black Sabbath meets Mogwai, and that is still a fair comparison. The Sabbath elements seem to be underplayed tonight, and they seemed more "mainstream" post-rock. That is, tonight what Graboids was doing was closer to the work of Explosions in the Sky, or Maserati. Now, i love those bands, and i really enjoyed Graboids set, but i feel like they did not do a lot to distinguish themselves from the crowd in their genre. So they were good, but seemed to fall more into the general party line in their somewhat obscure genre. 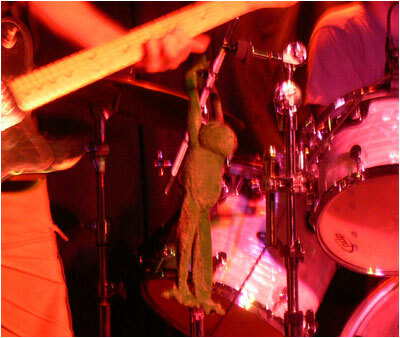 This froggie had to hold of for dear life during Graboids' set. Anyway, they played about a 40 minute set to about 20 people in the club. They were loud (although that might have been because i was alone in the space in front of the stage, taking pics with my camera) and sounded great. The mix was good, and Graboids came across well. I continue to enjoy what they are doing. Supposedly there will be a new record in 2009, and hopefully some more touring. If you are a fan of the spacey, posty, rock, you should check these guys out when you get a chance.